Canadians know that protecting our natural heritage is essential to our environment, our economy and our communities. That’s why the Government of Canada has committed to doubling the amount of nature protected in Canada’s land and oceans, from coast to coast to coast. 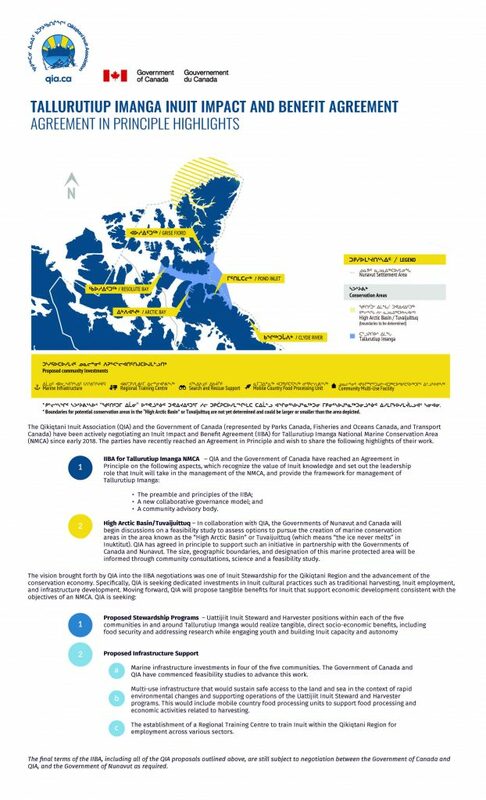 In August 2017, the Government of Canada and the Qikiqtani Inuit Association (QIA), along with the Government of Nunavut, announced the final boundaries for Tallurutiup Imanga National Marine Conservation Area in Canada’s High Arctic – making this important marine conversation area the largest in Canada. This represents approximately 1.9 per cent of Canada’s marine area and makes a significant contribution towards Canada’s international commitment to conserve 10 per cent of its marine and coastal waters by 2020. On October 30, 2018, an Agreement in Principle was reached, outlining key elements of the future Inuit Impact and Benefit Agreement for Tallurutiup Imanga National Marine Conservation Area, which includes a new collaborative Government of Canada-Inuit governance model and an Inuit advisory body for Tallurutiup Imanga National Marine Conservation Area. In addition, the parties agreed to consider options to pursue the creation of marine conservation areas north of Grise Fiord in the High Arctic Basin or Tuvaijuittuq (which means “the ice never melts” in Inuktitut). The Government of Canada and QIA have reached this important milestone in the negotiations of an Inuit Impact and Benefit Agreement for Tallurutiup Imanga National Marine Conservation Area, as required under the Nunavut Agreement. Once the Inuit Impact and Benefit Agreement is finalized and an Interim Management Plan is completed, Tallurutiup Imanga National Marine Conservation Area will be the largest protected area in Canada at approximately 109,000 square kilometres. Establishing Tallurutiup Imanga National Marine Conservation Area is key in helping to preserve Canada’s nature and the wildlife that depend on it, while ensuring that Inuit rights are respected and traditional activities continue to be carried out in the area for future generations. The Government of Canada and QIA are committed to establishing Tallurutiup Imanga National Marine Conservation Area and will continue discussions regarding the Inuit Impact and Benefit Agreement, with the goal of completing negotiations by April 2019. All parties are committed to providing updates to the local communities, stakeholders and all Canadians as other milestones regarding the establishment of the national marine conservation area are reached. In signing the Agreement in Principle, P.J. Akeeagok, President of QIA, Catherine McKenna, Minister of Environment and Climate Change and Minister responsible for Parks Canada, and Jonathan Wilkinson, Minister of Fisheries, Oceans and the Canadian Coast Guard, reaffirmed their commitment to finalizing an Inuit Impact and Benefit Agreement that would ensure the protection of Tallurutiup Imanga, an internationally significant natural and cultural area, for the benefit of present and future generations of Inuit and all Canadians.